If you’re looking for a vehicle with fun style, nice fuel economy and great tech options, all at a reasonable price, then you’re looking for a Kia! And if you’re in the Jacksonville or St. Augustine FL area, then you’ll want to shop at Family Kia of St. Augustine. We’re known as The Home of the Red Carpet Treatment, and we offer world-class service for every customer that contacts us online, calls, or walks into our showroom. Read on to see the benefits of shopping at Family Kia! We carry in stock 2019 models like the Kia Forte compact, Kia Sorento SUV, Kia Optima sedan, Kia Soul crossover and more, all at significant savings. Save as much as a couple thousand on a new Kia model with one of our vehicle specials. Our Platinum Prestige Award for 2018 is just the beginning of the proof that we are a world-class team known for a providing a high level of service, quality of facilities, and the sales process. Only 3% of Kia dealers received this honor, so we are proud to be part of this exclusive group. We are proud to have an exclusive Family Kia 3-Day Love It Or Exchange It Guarantee. If you don’t love your new Kia vehicle, and have driven it less than 300 miles, you can bring it back and exchange the vehicle within the first three days. All new Kia models come with the best warranty coverage in the industry for added peace of mind: 10-year / 100,000-mile limited powertrain warranty coverage. You also get a 5-year / 60,000 mile roadside assistance plan with a new Kia. Nice variety of used models priced to own today, whether they are certified pre-owned Kia or our wide variety of other manufacturers. You can call us or visit us on the lot for more information or to set up a test drive. Test Drive a Vehicle at Family Kia, Serving Jacksonville! At Family Kia, we are dedicated to serving you and helping you find the best model for the money. If you’re interested in learning more about the models we have on the lot or about the perks of shopping with us, come visit us on the lot and we’ll answer any questions you have or set you up with a test drive of your favorite model at Family Kia, located at 2665 U.S. Highway 1 South, St. Augustine FL. We also serve Palm Coast, St. Augustine Beach, Nocatee, Hastings, Ponte Vedra Beach, St. Johns and Jacksonville, among other local cities. 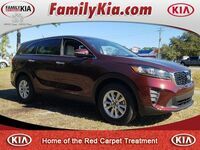 Please call us at (904) 808-0542 or visit us on the lot so we can set you up with a test drive, or check back here at www.familykia.com.